First, let me say I had no idea there were so many agile board solutions out there. The market is completely saturated with contenders. This probably happened because software devs have a particular way they like to work and when they can’t find something they like, they build it themselves. However, out of the myriad of contenders there are some that clearly rise to the top. FYI: I am not being paid by any of the software companies mentioned here and this post is entirely my own opinion. Another FYI: I definitely lean towards the Kanban side of the fence as opposed to Scrum. I much prefer simplicity and ease-of-use over an enterprise-level kitchen sink featureset and and this preference has flavored my rankings here. Definitely more metrics focused for using scrum at an enterprise level. This is a heavyweight software product that takes time to setup, maintain and operate on a regular basis. I could not find a way to simply add a task to the default Kanban board without first tying it to an existing user story. This left me with the feeling of being forced into a Scrum/Kanban hybrid methodology instead of a minimalist Kanban approach which is my personal preference. I have a feeling this requirement might be configurable in the custom workflow screens. The sheer number of options and boards available is a little overwhelming if all you want is a simple Kanban board. This is another enterprise-level offering with all the bells, whistles and gadgets. This one has a learning curve to understand the vast array of features. Plus the heavyweight nature of this kind of offering automatically entails more setup, training & ongoing maintenance work to make sure items are being entered & tracked correctly. 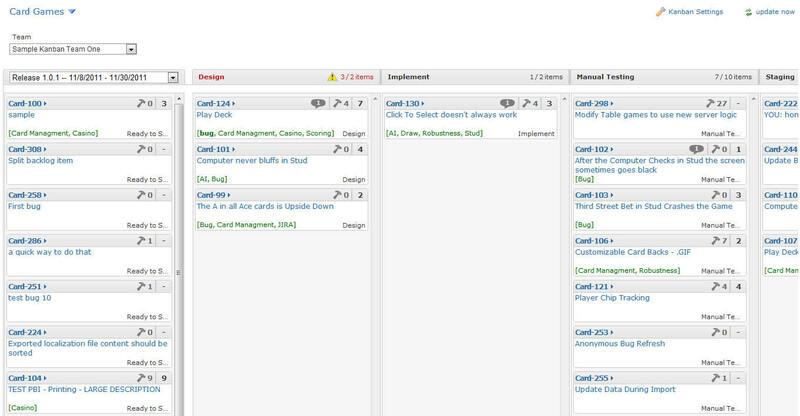 The “Card View > Workflow Mode” is the closest feature to resemble an agile board, but it’s not activated by default. The huge number of customizations available are overkill for small teams needing a simple agile board. Cost: Free for TFS users. Current TFS prices are here. Provides a nice visualization component for TFS, Microsoft’s software dev team collaboration offering. No need to manually add stories and tasks into yet another system if you’re already using TFS. This can be a huge time-saver and also prevent problems keeping multiple systems in sync. TFS is tightly integrated into Visual Studio, meaning that developers can update tasks in their IDE as they code, which are then immediately reflected on the agile Board component. TFS is another enterprise-level software offering with all kinds of bells and whistles. It’s brings great power to a project, but also a learning curve, setup costs and maintenance time. If your team is already using TFS, this board is a strong contender. 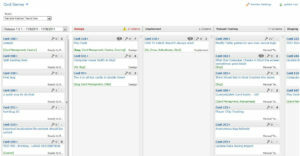 “Ready to pull” status on tasks exemplifies kanban pull methodology. 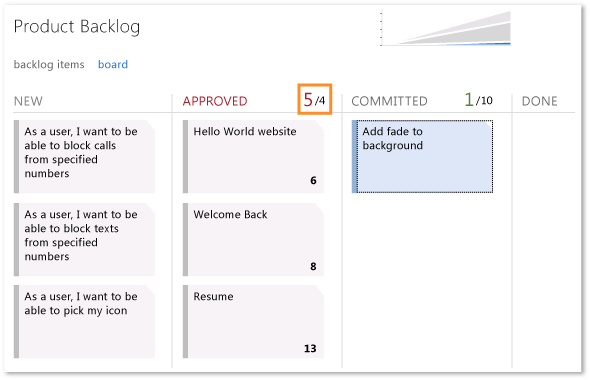 Allows admins to set different WIP limits on the different phases of the board. Now owned by Rally Software, which has it’s own agile development software, however there are no current integrations between the two that I could find. “Ready” checkmark on tasks exemplifies kanban pull methodology. Import tasks from a .CSV file. Export tasks to PDF or an AgileZen project. Activity stream (audit trail) of movement available. “Wall Mode” is an interesting feature that only displays the minimal board elements, presumably for displaying on a wall monitor in a common area. Ease-of-Use: Extremely Easy & Fun! I really didn’t want to like DropTask. It just seemed too easy and too simplistic to be of any serious value for anything other than a simple task list. But I kept coming back to it and I actually found the process of entering tasks and moving them around to be ENJOYABLE. I simply can’t explain it. The product doesn’t offer some of the advanced options available in other solutions in this list, but what it does, it does really, REALLY well. DropTask has huge potential and might well become the next evolution of agile development. I could easily see it outperforming other methodologies for specific use cases (although admittedly, no use cases spring to mind). That’s why I’m ranking this one as #3 on my list. Different views allow you to see tasks arranged by category, tags, deadline. 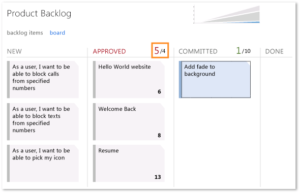 In many ways, Leankit is the de facto standard of Kanban boards. It’s quick to setup, easy to understand and yet has huge complexity within reach if you need it. No other board on this list was able to cover both angles: the simple & complex, combined in one easy-to-use product. As I wrote this blog post, I didn’t have a clear winner in mind. In fact, when brainstorming specifically about physical boards, I was surprised how many disadvantages there are. Even so, I can’t escape a few simple facts that make a physical whiteboard my favorite. You have complete control over the design of your board. You see immediate visual cues without logging in or bringing up a webpage. You experience the inexplicable satisfaction of moving “done” post-it notes across the board and “archived” ones into a physical trash can. But physical boards are chock-full of deal breakers for some people. No remote access. No audit trail. No automated analysis reports. Yet even after acknowledging these deal-breakers, physical boards are my firm favorite. All data for analytics reports has to be entered into an additional tracking system manually.